"I use the urban landscape as my canvas to inspire others to view the world through the lens of love." 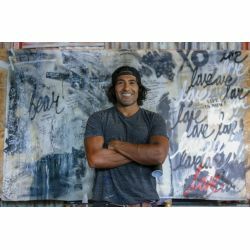 Ruben Rojas is an artist, speaker and co-founder of Beautify Earth. A native Angeleno, Ruben is inspired by the urban landscape and surrounding media culture. Through murals, paintings, corporate programs, and community activations, Ruben changes the way we view the world through art and collaboration. His murals are beautiful interruptions to the saturation of negative messaging that bombards the urban landscape. In their place, he brings messages of love, inspiring social change and transforming communities. Ruben’s art challenges the status quo and creates space for inquiry, activism, and change. The conversation shifts to push away negativity, and fear, opening the viewer to choose love. Utilizing the often overlooked spaces we encounter on a daily basis, as an example, he challenges our understanding of normal and encourages a community to gather inspiring and creating the change most just discuss. Ruben’s artwork is international. Painting in cities as far as Paris, New York, Florida, and Mississippi, and clients with as diverse a range. From GT's Kombucha, American Express, Heineken, Lulu, and Reebok. To the cities of Paris, Santa Monica, and New Orleans. Through his work, he inspires communities by transforming beige walls into unique, empowering messages. Reshaping self-limiting conversations, uplifting our daily world.